I have commented on numerous occasions just how much I enjoy the huge variety of work that I undertake. One day I can be making a batch of finials or spindles, walking canes or newel posts; the next demonstrating in one part of the UK or another, perhaps teaching a student a few days later, followed by more turning after that. Keeping so many balls in the air at once does require some good organisation to ensure deadlines are met and I get to where I need to be on time. Most of the time I can manage this juggling act but every now and again things can go wrong. This happened last month when an 'administrative error' meant I had an extremely full and long weekend of demonstrating and teaching, along with my usual monthly mix of production work and one-off specials, with a few tight deadlines thrown in for good measure - it keeps things pretty interesting. I had an email from a joiner based in Nottingham who was renovating an old building. 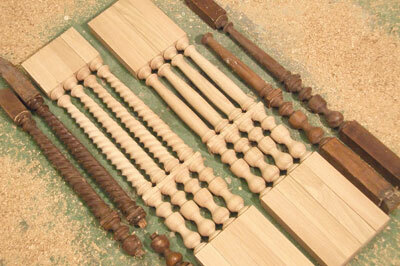 In the building was a staircase full of alternating plain turned and twisted spindles. As usual, several had broken over the years and so replacements were required to bring the staircase back to its former glory. Various photos were sent over to me with measurements so I could quote and my price was accepted. The last note on my quote, as always, was "delivery will be around two weeks from receiving the samples." Three weeks later I finally received the samples with a note saying how urgently they were required. This was frustrating because, if the sample spindles had been sent when the quote was accepted, the job could have been fitted in plenty of time. As it was, there was now a time issue. The problem though, is not that the job itself would take that long - less than two days in this case - but there were other jobs with equally tight deadlines that got in first. After some juggling of jobs and some long hours I managed to get the job done within the reduced time frame and the customer was happy. This was an interesting job for several reasons. Firstly, as you will see from the photo, two samples were sent of both the plain turned and the twisted spindles, and all four were different lengths. I rang the client and asked which he wanted copying, he didnâ€™t seem all that fussed as long as he got his spindles, so I averaged out the dimensions to reach the final design. The fact is, and this will seem an odd thing to say to anyone that has tried to make matching sets of anything, but it is easier and quicker to make several things the same than to try and make them all slightly different. It soon became clear why there were so many broken spindles when I started turning them; several parts of the spindle were less than 20mm thick which made turning them tricky at times. I got them all turned and then went on to the twisting. I always enjoy the challenge of matching a hand cut twist and I was pleased with the finished result. This was a four start ribbon twist and once I had the marking out sorted, it was easy to replicate. The first took me around two hours as I worked out the best order and tools to use; the last took an hour, which I was very pleased with. I had a further challenge around two weeks later when the guy rang up and said they had found a couple more broken spindles and needed one more of each. The plain one was easy as I had my copy template but I had to try and remember the setting out for the twist because, stupidly, I had thrown away my notes and workings out. Knowing what details to keep and what to throw away after a job is a real minefield because if you're not careful, you end up with file after file of sketches and notes and box after box of assorted copy templates which a few years down the line makes no sense to anyone! After a bit of head scratching and a few pages of working out I sorted it and sent these off to meet up with the others. I seem to be developing a reputation for being willing and able to take on jobs that other people won't even consider. 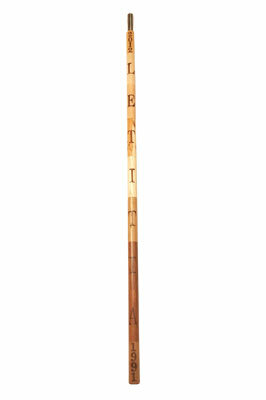 Just such a job came to me last month in the form of a multi-wood walking pole. A chap rang me and explained that he wanted a walking pole as a gift for his daughter's 21st birthday. It was to be made with nine different timbers all fixed to a 25mm diameter steel tube. His plan was to fill the tube with £1 coins which happen to be a perfect fit for the inside diameter of the tube. His daughter's name, birth date and this year were then to be pyrographed onto the pole. I naturally said I could do it and my price was accepted. I rummaged through my various boxes of wood, deciding that a mix of native and exotic wood would look good. I decided to try and fade from lighter woods at the top to darker at the bottom, whilst trying to be sympathetic to the grain patterns of the timbers. The woods I used were: pau amerello (Euxylophora paraensis), maple (Acer campestre), beech (Fagus sylvatica), yew (Taxus baccata), ash (Fraxinus excelsior), oak (Quercus robur), sheoak (Allocasuarina fraseriana), sapele (Entandrophragma cylindricum), and walnut (Juglans regia). I cut each block to size and drilled them out, I then mounted each between centres and trued them up from the hole, bringing it all into line. I then stuck them to the pole with polyurethane glue, which seems to stick most things together but also expands, which means glue gets to all parts rather than just sticking where it touches. 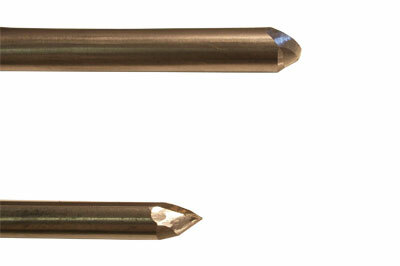 You could compare this to a giant pen turning kit. Once the glue had set I mounted the whole thing between centres and turned it down to the final size. I decided that my pyrography skills were probably not up to standard for a job like this so I had a chat with Penny Loseby, a member of our club who is pretty handy with a pyrography pen and she sorted it out for me. A few coats of oil and it was ready to go out. The weekend of the 12 and 13 May was the Woodworks show, organised by my club, The Tudor Rose Woodturners. I had arranged to spend the weekend on a stand with Gary Rance, running hands-on lessons in a surgery style. In the run up to the show a club contacted me and asked if I could do a demo on the Thursday before, as they had had a cancellation. I saw no issue with that and so agreed to do it. 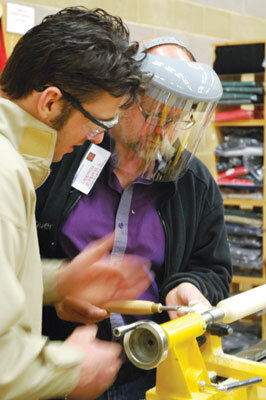 It was only the week before the show that I had another email from the Surrey Association of Woodturners. The booking secretary explained that she had booked me in for a demo on Friday 11 May but it wasn't listed on my website; she had noticed it was a busy time for me and wondered if there was a problem with the demo? It turned out that when I had filled in my new diary for 2012, I had missed the page with this demo and so it wasn't listed, but I wasn't about to start letting down a customer so I replied that there was no problem, it was just going to be a busy weekend! It was a busy weekend but very enjoyable. The two demos were well received and I spent the weekend of the show chatting to many turners about their problems and doing my best to sort them out. One thing that I have found when teaching, both over the weekend of the show and in my own workshop, is that people struggle with sharpening. This is a major issue because without sharp tools the whole process of turning is 10 times harder. 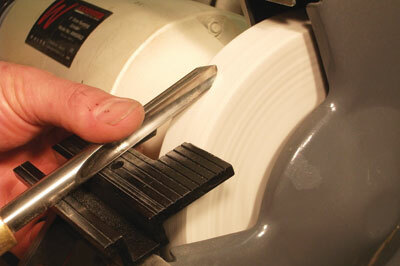 The difficulty with teaching sharpening is that, because there are so many jigs available to the turner, it is not feasible to own and master each one, just so I can teach people how to use them. All I can do is show how I do it, and explain the various options available. I basically sharpen free-hand from a tilting table. I tried totally free-hand for a while but found it difficult to maintain the bevel angle I wanted. The tilting table allows me to regulate this angle and then profile from there. I use and teach with a pretty basic tool kit: a spindle roughing gouge, a skew chisel of one sort or another - both of which can be sharpened by simply laying the tool on the tilting table - a spindle gouge and a bowl gouge. The spindle gouge starts on the table and as I rotate it, I ride it up the stone, which results in the wings being ground back. The bowl gouge I do slightly differently, because it has a steeper angle of around 65° rather than the 35° of the spindle tools. I keep the tool flat on the table and swing the handle round, rotating the tool as I go to produce a slightly swept-back wing which allows me to use it to its full potential. I also always grind the heel from my gouges and skews as it allows them to cut tighter curves and details much more smoothly. just to have a chat, but often apologise for disturbing me, but I really do not mind as it gives me a chance to talk to someone other than myself!